The partnership of forestry company, Rayonier Matariki Forests, and Omataroa Kiwi Project will provide an inspirational new learning opportunity for children at Te Kura o Te Teko School. Omataroa Kiwi Project, a kiwi conservation initiative developed by the trustees of Omataroa Rangitaiki 2 Trust, has been working for the last 10 years to protect the Eastern brown kiwi in the Puhikoko Reserve (approximately 500 hectares of native bush) and the wider 7,700 hectares within Eastern Bay of Plenty’s Omataroa Forest, which includes plantation forestry. The land is owned by the Trust. In collaboration with Rayonier Matariki Forests, who manage the production forest within Omataroa, the Te Teko Texas Rangers initiative was developed to provide a unique opportunity for senior students (aged 11/12) at Te Teko School to learn about kiwi conservation and the wider biodiversity of Omataroa Forest through an outdoor educational programme. Omataroa-Rangitaiki No 2 Trustee, Waaka Vercoe said the initiative would not only provide invaluable conservation education but it also aims to enable the children to connect with their whenua through a Matauranga Maori approach. “Our tamariki are the Kaitiaki who will lead this conservation work in the future and we hope to nurture their love for the whenua and understand the responsibilities that they hold as Kaitiaki. 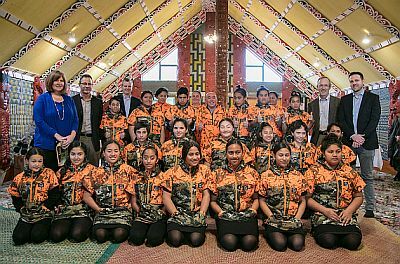 The programme will cover many aspects of Maori culture and traditions as well as a hands-on role in protecting the environment and wider bio-diversity,” said Mr Vercoe. Rayonier Matariki Forests has been working with Omataroa Kiwi Project for some years to assist with predator control. A closer relationship and increased support of the project has seen the company take an active role in funding and facilitating the forest visits. The educational framework will be implemented by a series of forest visits where the children will learn about their land, the different flora and fauna species and the importance of protecting them along with practical lessons in predator control and kiwi health checks and egg lifts. They will also visit Kiwi Encounters in Rotorua to see the kiwi chick hatchery and gain an understanding of the life cycle of kiwi. The pilot programme, which consists of eight sessions across Terms 3 and 4 of this year, will then be assessed with a view to continuing it for future senior students at Te Kura o Te Teko School. Photo: Rayonier executives join local Rayonier Matariki Forests staff at Ruaihona Marae, Te Teko to launch the Te Teko Texas Rangers inititative and are pictured with the first group of children to undertake the programme.